It’s not only the destination that is important when traveling. Hotels are now the new destination – as we want more and more of relaxing and detox vacations. And what is more important than sleeping in a beautiful hotel room for the ultimate experience? Here is 8 beautiful hotel rooms in the world. 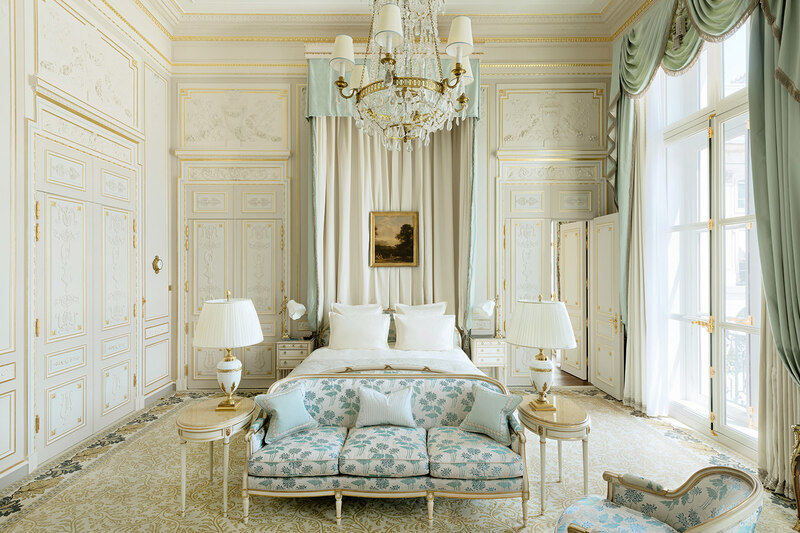 The Ritz Paris is known as one of Europe’s most beautiful hotels. The hotel was built in 17th century as a private mansion, but opened as a luxury hotel in 18th century by César Ritz. The Ritz was already then a famous hotel for the rich upper scale. Many of the suites has been named after famous people staying at The Ritz, including Coco Chanel, F.Scott Fitzgerald and Charlie Chaplin. The Windsor Suite is one of the most beautiful – decorated in the image of the Duke and Duchess of Windsor. Comfortable and simple architecture – Joglovina is built from 150 year old reclaimed antique Joglos. The bedroom has an open space with beautiful view over the sea and green, beautiful landscape. Imagine waking up to this beautiful view? Visit their Instagram page here. Palm trees – palm trees everywhere. I’m in love with palm trees, and having them as a print on my bed and curtains is the perfect match. Not only that, but a beautiful ocean-view from the balcony is not bad either. Exotic bedroom with typical Moroccan interior is like you’re living 1001 nights. This riad is located in a 400-year-old building. You’ll also find a garden and a terrace. This is the best hotel to explore the magical Moroccan city. If you want to live like a real fashionista, than this hotel is for you. The Sciaparelli Suite is named after the world’s first designer who named the color fuchsia. A beautiful hotel room and loving tribute to retro glamour, designed and furnished with witty style. Here you’ll live surrounded by tropical oasis, white sandy beaches and sparkling waters. And you’ll see all of that just right in front of your bedroom! One of Australia’s most famous resorts in a paradise island. All rooms enjoy their own private balcony or terrace – and some of them with outdoor decks and infinity plunge pools. This is the perfect place to spend with your better half. Waking up to this view is breathtaking. You can enjoy it from the small pool or while sipping on some coffee from the couch. The resort has 24 suites in a truly romantic and magical setting.